“The 5 Principles of Reiki” is often one of the first things we learn in Reiki during the first level of attunement and training.Quite often, its importance is also the least understood. I have found that many of the students who come to me for higher levels are neither aware of this nor understand the importance and its effect and therefore do not practice this! This makes them somewhat unfit to receive the second level attunement, and the fault lies with the Reiki Masters who give out the various attunements in a mechanical manner. Unless you start with the attitude of gratitude there is little hope for progressing further not only in Reiki but also in any other divine path that you follow. Many Reiki masters teach this not as “attitude of gratitude” but simply as “I will be grateful”. While technically, it is almost similar; it’s meaning it is actually quite different. Therefore, start with the principle of the attitude of gratitude by saying “just for today and every day – I will live my life with the attitude of gratitude”. By saying the five principles of Reiki in the following in the order and in the manner given below always helps in guiding through the day as it tunes the subconscious mind on the right path. By following this sequence of the Reiki’s 5 principles, you will automatically become a conduit for healing and universal love. The flow of Reiki becomes interrupted and positive things start taking shape around you. 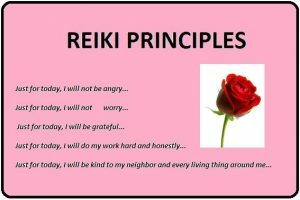 In my classes I always insist that even if you do not know anything about Reiki; have not been attuned, or if on certain days are not able to follow the entire procedure of Reiki practice you would be able to kick-start your day in the right direction just by saying these 5 principles of Reiki first thing on getting up every morning.